This is the smallest Camcorder in the world, it so small, even your fingers will be slightly difficult to press the "shoot" button on this Camcorder. 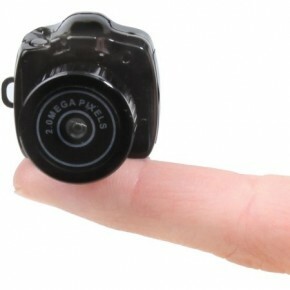 This gadget is no more than 1 inch and only 28 grams, but despite its small size, this camera can take pictures with a resolution of 2 megapixels (JPEG format, height 1200px, width 1600px). In addition, this Camcorder can record video with a duration of about half an hour, a very powerful capability for the world's smallest Camcorder. These camcorders are made by American companies gadgets, Hammacher Schlemmer, and sold at a USD 99,95.